tools available to aid GPs in their clinical decision making and earlier referrals or testing for possible cancer. Identifying patients with cancer or spotting those requiring investigation is challenging. General practitioners will see patients every day with symptoms that could be attributable to cancer, but are only likely to see eight patients a year with a new cancer diagnosis.10 General practitioners are also under pressure to ensure they are using NHS resources responsibly, and appropriately referring patients in a timely manner. A number of tools have been developed to support primary care professionals in referring patients with suspected cancer. Macmillan produces resources by GPs for GPs, which provide unique insight to ensure the resources and tools designed fully support GPs in their everyday practice. The UK nations have different referral guidelines for suspected cancer, as outlined below. In June 2015, NICE published its updated guideline for England and Wales on Suspected cancer: recognition and referral (NICE Guideline [NG] 12)13 Unlike the 2005 guideline that it superseded, this guideline is designed to better reflect how cancer actually presents in primary care. symptom-specific (by symptoms and investigation findings). secondary care and commissioners are challenged to provide and fund rapid access for GPs to more investigations that have traditionally been arranged in secondary care. The cancer taskforce strategy 3 for England recommends improved access to diagnostics and suggests multidisciplinary diagnostic centres could be beneficial; there is, however, a need for service providers to redesign 2-week wait forms and referral pathways to accommodate the NICE guidance changes. Macmillan is currently exploring the impact this is having on the GP community by conducting a survey with the extensive network of Macmillan GPs. The NICE NG12 suspected cancer guidance is lengthy, and a clear and concise summary is needed for everyday use by GPs. Recognising this, Macmillan has produced the Rapid referral guidelines,14 a toolkit summarising and organising the NICE guidance by tumour site. The toolkit is an interactive PDF that can be downloaded on to a PC, laptop, tablet, or mobile. It is designed to provide support, guidance, and practical solutions, allowing users to add contact information for local services so that patients can be signposted to appropriate healthcare services in their area. With a referral or investigation threshold at 3%,13 it is clear that more patients than previously fitting the referral criteria will not have cancer. In addition, we know that some people with cancer do not have symptoms that will fulfil referral criteria. To support clinical decisions, some other tools have been developed and are described below. QCancer®15 (www.qcancer.org) is a risk calculator developed by Professor Julia Hippisley-Cox and Carol Coupland at the University of Nottingham, using data from QResearch® database.16 It is based on algorithms looking at the predictive effect of combinations of symptoms for 12 different cancer types. It expresses the percentage risk of a current but as yet undiagnosed cancer.17 This tool has been integrated into EMIS Web,18 one of the largest primary care IT system providers. Professor Willie Hamilton, Professor of Primary Care Diagnostics at the University of Exeter, developed the Risk Assessment Tool (RAT), which calculates the PPV of symptoms, signs, or test results, individually or as pairs. The PPV is the percentage risk of a patient having a cancer, based on the reported symptom, group of symptoms, signs, or test results. The data were collected in primary care (General Practice Research Database) and published in the Cancer Prediction in Exeter (CAPER ) studies.19 The RAT was initially available in a paper format but has now been developed into a computer tool. Macmillan, in collaboration with BMJ Informatica, has developed an electronic Cancer Decision Support tool (eCDS)20 based on the above two risk calculators, and in 2013 successfully piloted the use of the eCDS tool in over 550 GP practices across England, Scotland, and Wales. The tool is designed to assist GPs when deciding whether to refer or request further diagnostic investigation in patients where there is a risk of cancer. 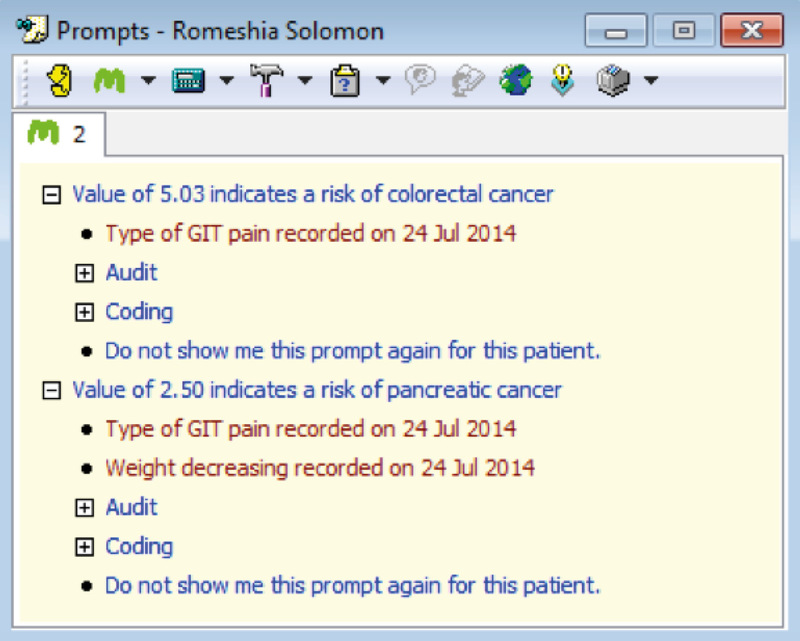 It comprises a reactive prompt (see Figure 1, below), alerting GPs to a patient's cancer risk, a symptom checker that can be called up live during consultation to calculate risk (see Figure 2, below), and a risk stratification function that enables practices to review their practice population in order of risk. The tool can be downloaded directly on to a PC by contacting the Macmillan prevention and diagnosis team, and runs alongside all major primary care IT software systems. See Table 1 (below) for recent updates on how Macmillan eCDS tool is being integrated into some of these systems. The tool is free to download and use for BMJ Informatica, Vision, and SystmOne customers, and runs alongside each of these systems. For EMIS customers the tool does incur an API fee. However, Macmillan is currently working with GP Systems of Choice (GPSoC) to add this to their suite of available tools, and once this is complete, the tool will be free to download on all primary care IT systems. EMIS has developed an integrated symptom-checker function based on Julia Hippisley-Cox's QCancer® algorithm. EMIS released the risk prompt function in an inactive form in September, and is continuing to develop these functionalities further with a subsequent rollout expected in 2016. Vision INPS is currently piloting its integrated cancer decision support tool based on Willie Hamilton's RAT in Scotland. The release date for the tool is expected later this year (2015). 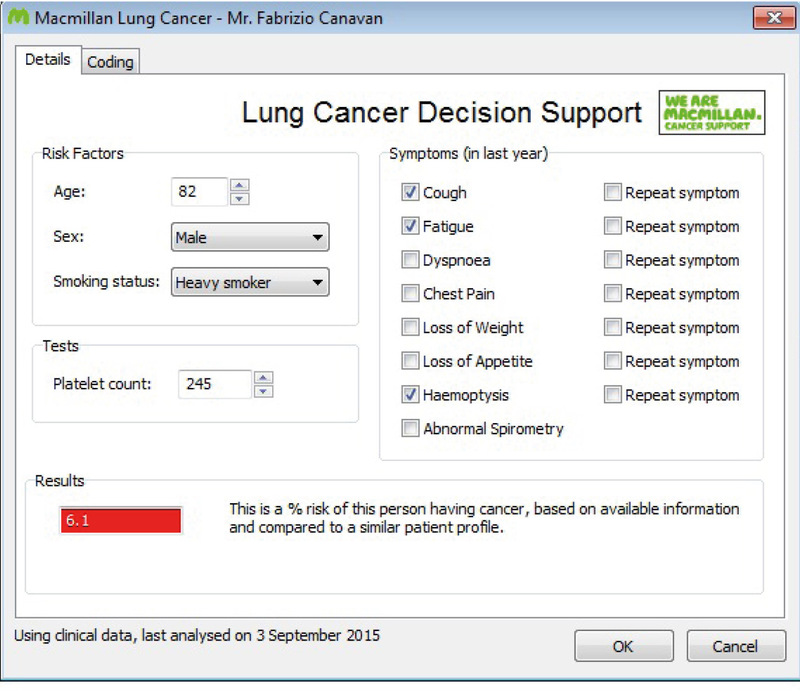 Macmillan is exploring the development of an integrated cancer decision support tool with SystmOne. General practitioners reported they would not have referred the patient in 19% of patients seen, had they not used eCDS. The tumour risk scores calculated by eCDS were different from the GPs' perceived risk in 46% of patients, with 31% of these 46% of patients having a higher risk score calculated by eCDS. For 43% of patients where eCDS was used, GPs reported taking action: 20% of patients were referred and 23% of patients required investigation. One GP in the pilot described a patient whose lung cancer diagnosis was prompted by the use of the tool, without which the diagnosis would have been made at a later date: 'We have just detected our first patient with lung cancer with this tool—recent CT "Suspicion of left upper lobe pulmonary malignancy". An urgent chest clinic referral will be made for the patient … This patient would not have been referred without this tool being in place. I have now referred three patients for further investigation based on the results of this tool' [GP involved in CRUK 2013 pilot evaluation]. Within the pilot, a risk of more than 2% was a prompt for consideration of action and risk of more than 5% was a prompt for urgent referral in most patients. This was very much at the discretion of the GP on a case-by-case basis, as there is no clear consensus on these 'prompting' thresholds at present. Following the success of the eCDS tool, Macmillan is further developing the tool and working with the major primary care IT providers in the UK to develop integrated versions that will sit on a number of IT platforms and become available to all GP practices. For more information or to download the tool visit www.macmillan.org.uk/ecds. Identification of cancer is challenging for GPs, who may need help in recognising the signs and symptoms. The 2015 updated recommendations in NICE NG12 on the recognition and referral of suspected cancer13 are based much more on the realities of how cancer actually presents in primary care than previously, and as such have the potential to improve 1-year survival by facilitating earlier cancer diagnoses. They do bring, however, certain challenges, especially around changes in referral thresholds and a greater onus being placed on primary care. In order to support GP colleagues, Macmillan has developed tools by GPs for GPs—the Rapid referral guidelines14 and the eCDS20—to support GPs in their decision making and raise awareness of cancer signs and symptoms. Macmillan Cancer Support's prevention and diagnosis programme team would like to offer specific thanks to the following people for their work on this article: Dr Steven Beaven, Dr Anthony Cunliffe, Dr Jackie Dominey, Dr Bridget Gwynne, Lindsey Hunter, Dr Rosie Loftus, Dr David Plume, Dr Nicola Robinson. Extra capacity is likely to be necessary to ensure the national 2-week wait, 31-day, and 62-day cancer waiting targets are not further compromised and the delay shifted from initial suspected diagnosis to later definitive treatment. Cancer Research UK website. Cancer survival statistics. www.cancerresearchuk.org/healthprofessional/cancer-statistics/survival (accessed 17 September 2015). Public Health England. Cancers are being diagnosed earlier in England. PHE, 2015. Available at: www.gov.uk/government/news/cancers-are-being-diagnosed-earlier-in-england (accessed 2 October 2015). Allemani C, Weir H, Carreira H et al and the CONCORD Working Group. Global surveillance of cancer survival 1995–2009: analysis of individual data for 25,676,887 patients from 279 population-based registries in 67 countries (CONCORD-2). Lancet 2015; 385: 977–1010. Coleman M, Forman D, Bryant H et al. Cancer survival in Australia, Canada, Denmark, Norway, Sweden, and the UK, 1995–2007 (the International Cancer Benchmarking Partnership): an analysis of populationbased cancer registry data. Lancet 2011; 377: 127–138. Abdel-Rahman M, Stockton D, Rachet B et al. What if cancer survival in Britain were the same as in Europe: how many deaths are avoidable? Br J Cancer 2009; 101 (Suppl 2): S115–S124. Cancer Research UK website. Science blog. New NICE GP guidelines have huge ambition and potential. scienceblog.cancerresearchuk. org/2015/06/23/new-nice-gp-guidelines-havehuge- ambition-and-potential/ (accessed 17 September 2015). Healthcare Improvement Scotland. Scottish referral guidelines for suspected cancer. Scottish Government, 2014. Available at: www. healthcareimprovementscotland.org/our_work/cancer_care_improvement/programme_resources/scottish_referral_guidelines.aspx (accessed 17 September 2015). Healthcare Improvement Scotland. Scottish referral guidelines for suspected cancer: quick reference guide. Scottish Government, 2015. Available at: bit.ly/1QIbhhq (accessed 17 September 2015). QCancer® website. www.qcancer.org (accessed 17 September 2015). QResearch® website. www.qresearch.org (accessed 17 September 2015). Hippisley-Cox J, Coupland C. Symptoms and risk factors to identify women with suspected cancer in primary care: derivation and validation of an algorithm. Br J Gen Pract 2013;63 (606): e11–e21. Hamilton W. The CAPER studies: five case-control studies aimed at identifying and quantifying the risk of cancer in symptomatic primary care patients. Br J Cancer 2009; 101 (Suppl 2): S80–S86.